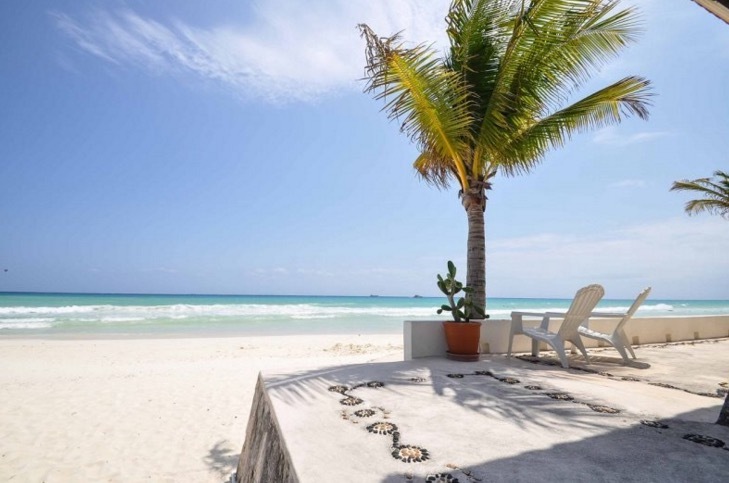 Coco Beach, Beachfront – New to the market Sept 2016 is a beautiful Playa del Carmen beachfront corner condo for sale. With a nonstop ocean view on 2 sides, and just a five-minute walk to Playa´s glamorous Fifth Avenue, with its endless options of boutiques, restaurants, sidewalk cafes and bars, this condo makes a great investment property and a wonderful lifestyle . This unique residential complex, Casa del Mar overlooks the turquoise, crystal-clear waters of the Mexican Caribbean. It will provide its privileged owners the very best that Playa del Carmen real estate has to offer. Casa del Mar condo for sale is targeted to investors in pursuit of a solid investment in the top niche of the real estate market in an area that has had a sustained increase in property value for the past 7 years but is yet to mature fully. Growth potential still in the property. This fully equipped condo for sale includes the best quality marble floors, air conditioners, fully fitted kitchen with refrigerator, stove, fans, washer/drier and even a reverse osmosis water purifier for drinking and cooking. All this while assuring a luxurious ambiance throughout the complex that includes elevators, roof top swimming pool and a lush interior jungle garden, and parking. Fully complete offering in the great condo Playa del Carmen for sale. Notably, the building design ensures very low condo fees while delivering a luxury experience and maintaining building preservation, all the while protecting your long-term investment. The owners have furnished this unit with high-quality custom made furniture built to last and have used this unit for personal use only, but is fully setup for rental. The building has undergone substantial improvements in the last year ensuring that your costs remain low in a well-maintained building. The ool has been resurfaced, there is new Trek decking ( looks like wood but does not need maintenance), new poolside furniture for comfortable lounging, and water softener throughout the building which means your appliances last longer and ladies, your hair will always be great. This condo is ready to move in or rent! Call us now for this stunning 2 bedroom condo for sale. How do you plan to spend your retirement? Is moving South an option? Have you considered relocating to a warmer region for this new phase of your life? The ultimate dream location for outdoor enthusiasts, the Riviera Maya offers multiple beach and aquatic activities such as kayaking, snorkeling, diving, swimming, fishing and sailing. The area also provides opportunities to explore natural and historical treasures including Mayan ruins, cenotes and eco-parks. And let’s not forget all the great bars, restaurants, boutiques, and golf courses! Without a doubt, the Riviera Maya gives you plenty to do for many many years! 2. With more than 300 sunny days annually, a healthy diet of local fresh tropical food, a laid back lifestyle and beautiful surroundings, your quality of life will greatly improve. Your retirement may just be some of the best years of your life! 3. Mexico has all the familiar comforts and commodities you have back home. You’ll find all the major brand name stores such as Costco, Wal-Mart and Home Depot. Mexico also has excellent health services for a fraction of the price. Now that should really ease your mind! 4. The average cost of living in Mexico is 60% of that in the U.S. and Canada. As a result, you’ll enjoy a much higher standard of living! 5. In addition, property taxes are almost nonexistent compared to the 3% that you have in the US and Canada. That means no bad surprises at the end of the year! 6. You may be thinking that Mexico and the Riviera Maya sound wonderful but that it’s just too far from your home and family. Well, no worries because the Riviera Maya is extremely well connected to the US and Canada with over 50 non-stop flights daily. That, combined with one of the best airport and highway transportation systems in the world makes every traveling experience smooth and trouble-free. The distance won’t feel quite so far from your loved ones. 7. Mexico’s economy is booming and currently one of the strongest in Latin America. Surpassing China for quality and price, Mexico is now the world’s top producer of manufactured goods. 8. Mexico’s tourism is booming and it’s even more the case in the Riviera Maya. Of the millions of tourists who travel to Mexico annually, 70% choose the Riviera Maya as their final destination. As a result, Real Estate sales and the demand for property continue to grow. 9. Thanks to its great weather, beautiful beaches, incredible hotels, world-class golf courses, and ecological and archaeological treasures, tourism and investment in the Riviera Maya keep increasing. It currently is the fastest growing region on the planet. You’ll find great infrastructure, amenities, creature comforts and as a result, a thriving Real Estate market. You can expect on average a 25% equity gain on a pre-construction condo purchases upon project completion. In short, you just can’t lose when you invest in property in the Riviera Maya. 10. Due to the booming tourism, there’s a 100% occupancy rate in the Riviera Maya during the busy season. Demand often exceeds availability. So if you plan to rent your property, you don’t have to worry about finding enough renters. The average investor can expect to see an 8% ROI annually from rental income alone. Beachfront, Playa del Carmen – TRUE BEACHFRONT Playa del Carmen condo for sale !! Deluxe Luna Encantada end condo for sale. Everyone covets the opportunity to own a beachfront condo such as this and only the most discerning buyer of real estate in Mexico will be able to buy this Playa condo. 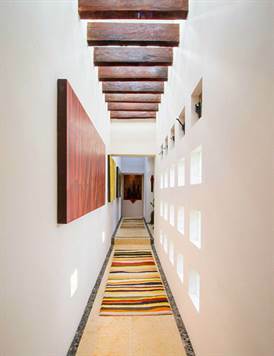 One of the greatest locations in Playa del Carmen; right on the beach & steps to lively 5th Ave! We are situated on the first floor, mere steps to the infinity pool & the beach where your private loungers & umbrellas await you. Full-length wide wrap around balcony gives you the “I own the world feeling”, with a completely unobstructed view of the Caribbean and the quiet parade of beach life. Spectacular views of Cozumel Island and of the boats, cruise ships, parasailers etc. that go by! C1 is a gorgeous 1600 square foot, three bedroom, two-bath condominium with floor-to-ceiling sliding doors to the balcony so you enjoy beautiful views from both inside & outside the condo. The balcony is equipped with table and chairs, and cozy loungers to relax while dining al fresco or simply reading a book while sipping a margarita! And you are mere steps to the infinity pool and beach with private loungers. 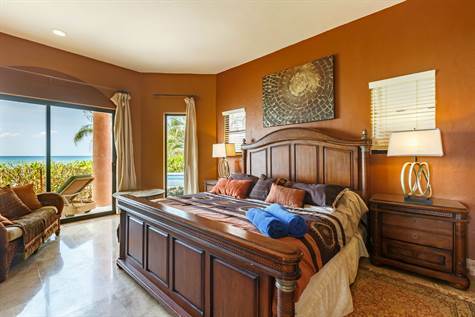 Our custom decorated beachfront home includes a luxurious master suite, two granite, and travertine tiled bathrooms and enjoys the finest quality furnishings. Each bedroom is appointed with superior quality mattresses & linens. The master features a king-sized bed with en-suite bath, the second bedroom has two comfy queen beds, and the cozy guest room has one queen. This allows us to comfortably accommodate up to eight people. 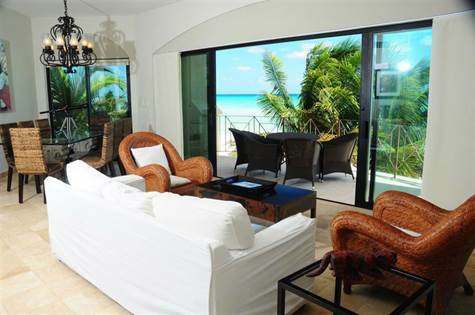 Luna Encantada is one of the most elegant privately owned condos on the Riviera Maya. Beachfront living right on the incomparably blue Caribbean with 180-degree views of paradise in a quiet serene setting, yet just a block off 5th Avenue (walk to everything!). -Large kitchen island, large master bedroom with shower. Washer/dryer unit. Underground parking. -Main floor condo sits right on the beach. -Close to 5th Avenue for shopping, dining, and nightlife. Ferry to Cozumel just blocks away. We are within easy walking distance of dive boats, shopping, spa treatments, and world-class dining. Take a two-minute walk to beach-side bistros with dining choices ranging from regional Mexican fare to five-star dining. Play golf, snorkel, scuba dive, windsurf, para-sail, deep sea fish, bike, boat, walk and explore the beauty and history of the Mayan Riviera from your home away from home. Playa del Carmen and Luna Encantada are easy to get to: fly into Cancun and either take a 40-minute cab to Calle Sixth and the beach or a luxury bus to the Playa terminal just two blocks from your vacation home. (Alternately, you can fly into Cozumel and take the ferry across the Caribbean and land just a few blocks from your vacation home.) We are happy to arrange for your airport transportation via private van delivered right to your condo door! Come explore Playa del Carmen and bask in luxurious living at Luna Encantada! 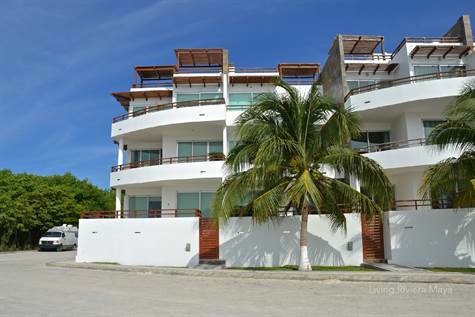 Beachfront, Playa del Carmen – Prime location right on the beach, right in the heart of Playa del Carmen. Gorgeous 3 bedroom beachfront luxury condo for sale. A great property for private use and a turnkey investment condo ! This is an amazing cozy place in the absolutely best location. Great rental pool, quality finishes throughout and great amenities make this an opportunity for you ! Playa del Carmen is a charming beach town, with a great vibe. It has no high-rises and has a laidback more European feel. Ask us about the gross income this property could fetch you ! Ask us for a private viewing ! 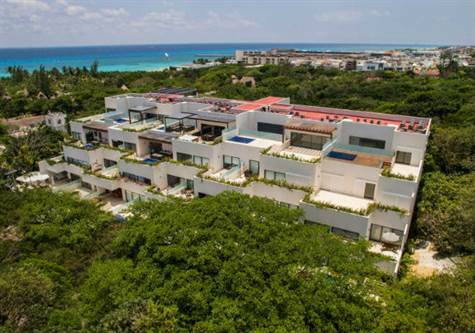 Playacar Phase 1, Playacar – Gorgeous home for sale is located in the exclusive gated community of Playacar Phase 1 and is only a short distance to the beach and a 6-minute walk to Playa del Carmen Downtown. It offers ocean views from the second floor and unobstructed views from the third floor Jacuzzi lounge area. 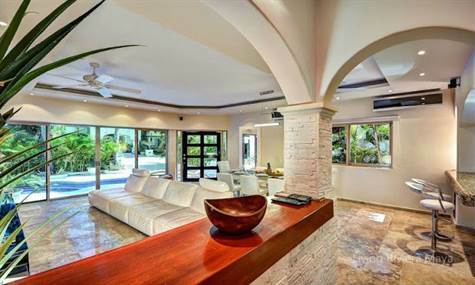 This home for sale in Playacar features modern & stylish finishes; marble floors throughout the house, granite counter tops, stone lined shower walls, Italian rain shower, equipped semi-open kitchen to the dining room and living room. Spacious bedrooms offer four king size bedrooms and one queen size service room, all of the rooms have their own private bathroom, flat screen, AC, fans, black out blinds, two of them electric and a security system. Two of the bedrooms have cinema screen and movie projector, one of the two rooms has a cinema style couch. The living room area, with a big couch and perfect flat screen with surround system. Perfect for any movie lover. The house also has a washing room and a linen closet. Lots of outdoor living in this home. Enjoy the Caribbean breeze, salt air and warm sun. Lots of shade too, but you’ll want to laze in all of these places. On the first floor, we have the pool, outdoor couches, beach bed and two grills. The second floor has a terrace with more outdoor couches for lounging, hammocks, a garden table and even a steam room. The third floor or lounge has a Jacuzzi, a couch, service station and without a doubt the best view. The perfect home for total relaxation. 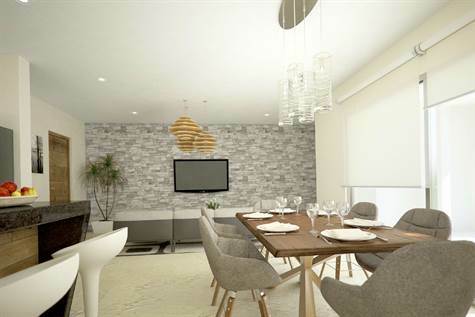 Casa de lujo en venta, esa propiedad ubicada en el Exclusivo Residencial Playacar Fase I, a unos cuantos metros de la playa y muy cerca del centro de Playa del Carmen, cuenta con vistas al mar desde la segunda planta y vista in-obstruida desde el área lounge con jacuzzi del tercer piso. Cuenta con modernos terminados en pisos de mármol a lo largo de toda la casa, barras de granito y baños recubiertos de lístelo de piedra y regaderas italianas, cocina equipada semi-abierta al comedor y sala, cuatro amplias recamaras, King size y una recamara de servicio, matrimonial, todas las habitaciones cuentan con baño privado, pantalla plana, aire acondicionado, ventiladores, persianas enrollables black out, dos de ellas eléctricas y sistema cerrado de seguridad. Dos de las habitaciones cuentan con pantalla para proyector de películas, en una de estas hay cómodos sillones para crear un cine en cualquier momento. La sala tiene un sillón muy amplio y una pantalla plana perfecta, con sistema de sonido envolvente. Entre otras cosas cuenta con cuarto para el centro de lavado y closet de blancos. En el primer piso se encuentra la alberca con sillones, una cama de playa y dos grills, en el segundo piso se encuentra la terraza también con sillones, hamacas, una mesa de jardín y un cuarto de vapor. El tercer piso o lounge cuenta con un jacuzzi, sillón, estación de servicio y sin dudarlo la mejor vista. Call us to see this gorgeous home for sale in Playacar, an exclusive community with direct beach access, beautiful streets with palm trees and lush greenery and Mayan ruins.